It’s important for you to know that most car, truck, SUV and motorcycle accidents do NOT result in criminal charges. This happens because auto accidents are considered a civil matter unless someone involved actually broke a law – such as leaving the scene of the accident. So, if you were seriously injured in a car accident and considering legal action then you’ll most likely file a civil action — a lawsuit. That the law requires them to pay the costs of your injuries. This is carelessness, or failure to prevent something when a reasonable person should have known it was likely to happen. This is the most common type of claim in Missouri auto accident lawsuits, because most accidents are caused by driver inattention. For example, if another driver rear-ends you because he is “rubbernecking,” he was almost certainly negligent, because he failed to take a reasonable amount of care to make sure he didn’t hit you. The general rule is – if the other driver broke a traffic law, chances are good that he or she was negligent. This is when someone deliberately did something that injured you. If a driver left the scene of a crash, he probably committed an intentional wrong. It’s important for you to know that you can file a lawsuit over an intentional wrong regardless of whether the defendant is already being criminally prosecuted. Again, if the other driver deliberately broke a law, it will be easier to prove an intentional wrong. This almost always applies to cases where a defective product caused an auto accident. Strict liability says manufacturers are legally liable for injuries caused by their defective products, regardless of whether they were negligent or intended to manufacture a substandard product. Cases over defective child car seats, tire tread separation and SUV rollovers could ALL be strict liability cases, depending on the circumstances. Missouri state law allows you to sue even if you’re partly responsible for your own injuries, but reduces your recovery. Under a rule called comparative negligence, a jury will decide how much fault you bear for the crash and reduce your compensation accordingly. So, if you win $1 million – but a jury decides you were 25% responsible for the accident – you will collect $750,000. That’s three-quarters of that $1 million. This works the same if you sue more than one person at the same time. When that happens then the people you sue have to share the costs between them, minus any % of responsibility of fault on your part. 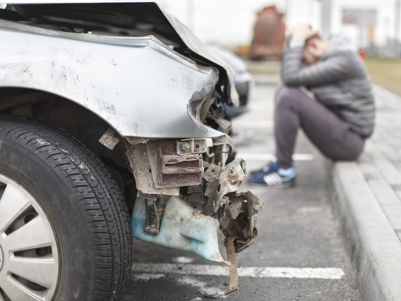 Almost all auto accident cases involve an auto insurance company. Many will cooperate in a lawsuit. However, an insurance company may refuse to pay a legitimate claim simply because it thinks cheating a customer is cheaper. This is called insurance bad faith, and it’s illegal. If you’re a victim of insurance bad faith then you have options. Per Missouri State law you can sue the insurer for attorney fees, punitive damages, and the cost of the claim you’re entitled to. Punitive damages are payments that punish an insurer for illegal behavior. That makes an insurance bad faith lawsuit a better deal for you — and a worse prospect for the insurance company. And win you the best possible compensation!